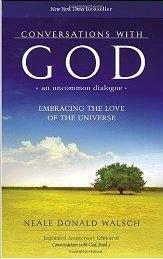 I had seen the book, “Conversations with God: An Uncommon Dialogue” by Neale Donald Walsh over the years but never picked it up.The name put me off. I’ve seen too many people ‘speak for God’, while saying things I simply refuse to accept not to be wary. I’ve seen and read about too many atrocities done “in the name of God” not to be put off by that word. I suppose that’s probably one reason why when, years ago, Seth called it the All that Is [Is for short] and Michael called it the Tao [Path] that I warmed to what they had to say.They steered clear of that emotionally charged word and I was grateful. OK, yes, I know.I’ve done those things that turn me off so vehemently.Over the ages I’ve been on the planet I’ve done them all. And that is why I reject them now. Been there/done that—and have seen the results. I’m absolutely certain I participated in the Crusades or something similar. And I’ve been the hapless victim, an innocent bystander, of people who went to war in the name of one god or another. I’m sure that I have pushed my viewpoint on others and burned them if they didn’t agree with me. And, I’m virtually certain I was drowned as a witch during medieval times. So the title of the book put me off. It’s funny, though.When something calls to you, you eventually hear it.Or it won’t shut up until you do. Have you ever had that experience? My life is full of them. On a forum I visit, a woman with the handle, ‘Hairless Cat’ recommended the book. I respect her views so I was inclined to try it—but I kept putting it off. Then, last week, a woman in my neighborhood offered to lend it to me. In case you haven’t read it, some background:It’s a book of automatic writings. The author claims the dialogue is with ‘God’. While I find that difficult to swallow and, likewise, have a hard time believing that an entity on the Causal Plane, say, would pass itself off as the All that Is, I’m working to keep an open mind. In any case, the communication coming through fits with the other information coming from the Causal. So a post will be coming soon. Actually, although I added another post after this one, I found that I was put off by much of the book. It was too commercialized for my taste, for one thing. I later learned that there’s quite an industry around this series – which is not the case with the other books I’ve been using both for my own education and for this blog. Secondly, a good portion of the information I’ve read, so far, doesn’t seem to fit with the information I’ve received from sources I’ve come to know well and trust over the course of several decades. So, once again – I’ve put this book down. I’m not saying you shouldn’t read it or that it doesn’t deserve a hearing. In fact, if someone else has read it and likes it, I’d like to hear your opinion. It’s just not my cuppa.